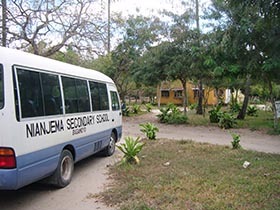 100% of all donations go directly to Nianjema Schools (preschool, primary, secondary) in Bagamoyo, Tanzania. Financial contributions to TEF are tax-deductible. Watch this four minute video to see Nianjema's story and campus. Aid for Africa, a charity alliance of US Based nonprofits and African partners, also underwrites scholarships for girls to attend Nianjema secondary school. Such scholarship support makes it possible for families to keep their daughters in school. Nianjema emphasizes the support and education of girls because girls, especially those from poor families, are too often forced to drop out after completing elementary school. Imagine 6 people riding on one motorcycle to school. This was the dilemma of many parents at Nianjema. The problem has been solved. A new school bus with Nianjema Secondary School on one side and Margery Wolf Kuhn Primary School on the other. As the bus goes around picking up students more distant from the school, they advertise the school they are proud of. Students who live closer walk or ride their bicycles to school. 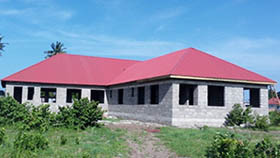 The construction of the Modern Medics Clinic Tanzania is underway. (See the new “Clinic” menu item!) Slated to open in 2017, Modern Medics will provide health care to Nianjema students and staff and for the surrounding underserved area. Generous grants from the W. O’Neil Foundation and the Carney Family Foundation supported the early building efforts. 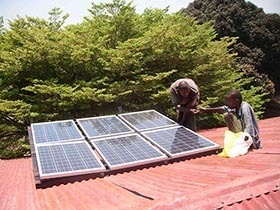 The campus community transformed with the addition of solar panels to the large central Dining Hall. Students can now study at night in groups as well as eat in a lighted hall during the rainy season. 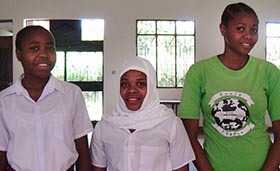 A Tanzanian Education Fund initiative will raise $6000 to support the children of Nianjema teachers who need financial assistance. “The Fund will help the teachers and their children. Our teachers are eager to have their children at Nianjema, and 18 children qualify. The teachers have feelings of pride and dignity and would be very gratified by this assistance,” says school manager Charlie Sloan. Lovely bougainvillea, coconut trees, mango trees, exotic plants and beautiful walkways grace the Nianjema campus, making it a joy for students, staff and visitors. The landscape is an almost 20-year project of on-site gardeners. 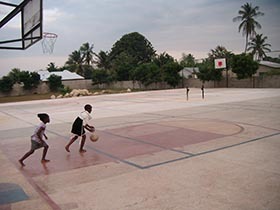 Two new basketball courts are among the most popular additions to the Nianjema campus. Located near dormitories and the soccer field, the courts are side by side and can double as tennis courts. A hop-scotch court keeps the little children busy. Indoors, beautiful new Terrazzo floors have replaced the concrete floors in all classes, staff administration building, dining hall and science buildings. The floors are beautiful and safer.